On the edge of a 1000' cliff drop. It was my first time at Syncline, a trail network in Southern Washington near Hood River, OR. I didn't get to see everything it had to offer, but we managed to ride a lot of the good stuff. I felt completely challenged throughout the day, from short punchy climbs to technical rock garden downhills. I rode my Epic, which is perfectly capable, but I wish I had my Stumpjumper FSR with knobbier tires, extra travel and a dropper post. Our trail ambassador, John, tackles the lower section of Little Moab. Syncline is located at the very edge of the Cascades and eastern Washington and Oregon. The gentle climb up the Jeep Trail switchbacks give you ample opportunity to enjoy the view. Syncline sits in the Cascade's rain shadow, so drier conditions can be found in the winter time. Naturally occurring bike wash station to keep your steed clean afterwards. The wide open landscape is beautiful and breezy, so come prepared with a windbreaker. Andy carving up the lower part of Little Moab. Feeling grateful to be living in such a breathtaking part of the country. We started our climb up the Jeep Trail, a series of switchbacks traversing the Southeast part of the park before intersecting the Little Maui and Little Moab trails, roughly halfway to the top. My crew of five kept my pace in check, allowing me to slow down and take in the inescapable views of the Columbia River Gorge and Mt. Hood out in the distance where threatening rain clouds are kept at bay. We make our way towards the top of the Jeep Trail before taking in a quick breather and blast our way back down, splitting off to descend Little Moab. This 'fun' section of trail hugs the west facing cliffside, featuring lots of rocks, drops and technical goodness. The only way down is to commit, especially when you're riding blind, figuratively speaking. The trail gets so close to the edge you can almost taste the 1000' vertical drop below. I was told someone died on this trail not too long ago, so be careful in picking your lines. From there we climbed halfway up the Jeep Trail and connect over to Little Maui, a tight and twisty piece of single track, weaving in and around large rock faces, bringing you back to the bottom. Daylight was burning out, and my company was winding down. I had energy left for one more loop but decided to call it a day. At the parking lot we ran into the Fat Tire Farm shop crew who were shuttling up and down via Courtney Road. The other sections of trails I didn't get to ride were further north towards the top and over to the east along Hidden Canyon. Stringing everything together could easily top 5,000' of climbing and as much descending. Be advised that this is a multi-use trail system with lots of hikers on the weekends. The trail gets so close to the edge you can almost taste the 1000' vertical drop below. 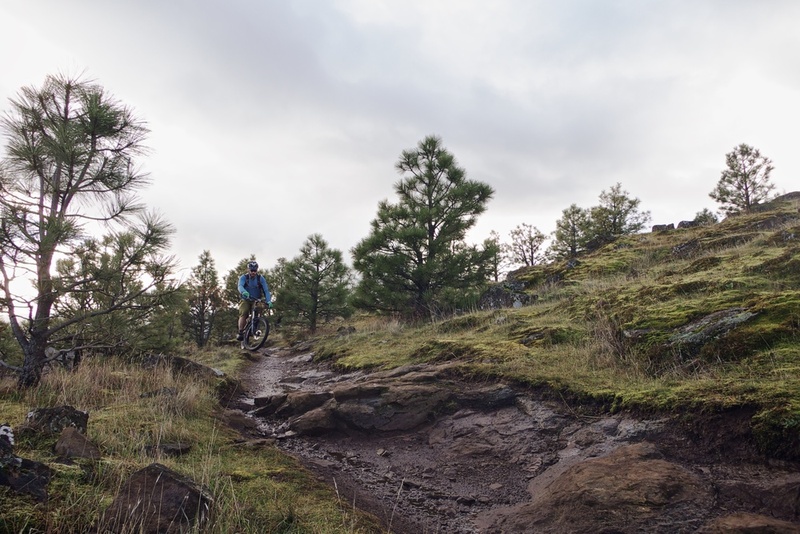 Winter is the best time to ride Syncline as the trail system sits in a rain shadow just east of Mt. Hood and the Cascades. As a result the trails stay more dry . I'm told that it's hardly worth coming to Syncline in the summertime since there's a typically high concentration of ticks and poison oak in the area. Getting there is pretty easy. It's roughly an hour and a half from Portland. Just take Interstate 84 east until you get to Hood River, where you'll cross the Columbia River and into Washington State. Hang a right and drive 5 miles just past Bingen and look out for Courtney Road. The parking lot is right there with additional parking along the road. Because the land is so exposed I suggest bringing a lightweight windbreaker. It's the middle of January, and all I had to wear was a base layer, lightweight jersey and jacket, along with some knee warmers and a cap to keep warm. It's always fun riding somewhere completely new. I was scared, excited and happy all at the same time. An adventurer's natural high. On the very first switchback turn I knew I was a somewhere special. Within less than a mile I already wanted to come back for more. It rivals a lot of the trails I've ridden in Northern California the past few years in terms of challenging terrain, epic views and general fun factor.